Hey guys! Here’s some great info about Ageless. It’s pub date is May 3, 2016! Here’s something fun for APRIL FOOL’S DAY! It’s an AGELESS MAD LIB pulled straight from the story! I’ve named it "Aless Runs into Grey" - Send me your results @PaulInmanSC on Twitter or Instagram! In other news, WE HAVE A VENUE FOR THE LAUNCH PARTY! I’ve partnered up with a local comic book shop called Coastal Comics! Saturday, MAY 7, 12-2pm. Come and hang out with me! 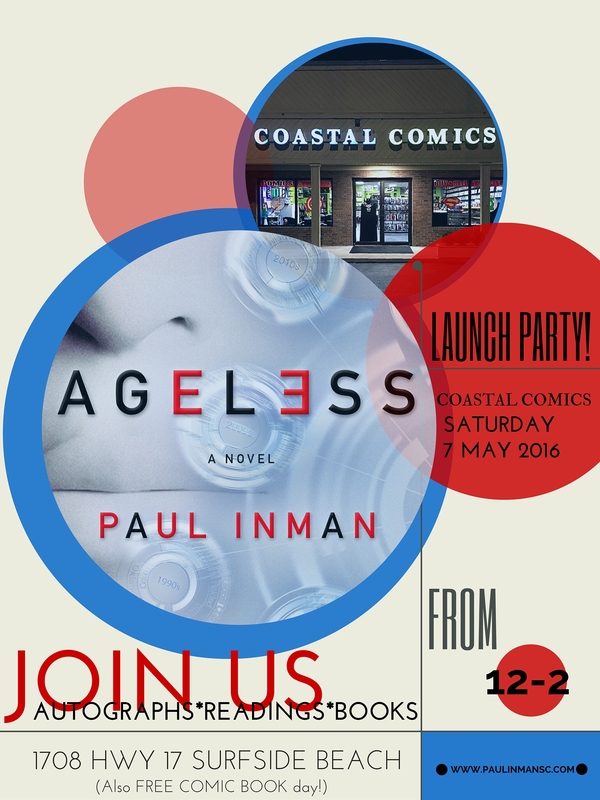 Get your copy of Ageless signed and maybe hear a reading and some free swag...(wait who’s paying for that??) Also, pick up a free comic book while you’re there for Free Comic Book Day! Ok, last thing, promise...for this update at least... The book will be coming to you very soon! Traditionally, backers receive their e-book about month before release *checks calendar - Just over a month until Pub. Day on May 3rd! * which should be ANYTIME NOW! The physical copy comes shortly after that! I NEED ONE LAST thing from those of you who supported this project from the beginning - REVIEWS! Fair and honest is best, but if you’d like to tell me how AMAZING (haha) the book is, that would be OK too. Leave them at any (but really all) of the places below. ADD AGELESS TO YOUR WISH LISTS/TO READ LISTS! GOODREADS PAGE - NOW OPEN and we are 4.9 out 5 stars! BARNES AND NOBLE PAGE - Preorders only, but it’s a good price right now! Thank you, and remember, you did this. Hello all. I made some revisions to "Technological Chains" and added to the middle of the draft. Read it over and let me know what you think. And, do be too shy to follow me on any social media.